We celebrate the end of this season by letting you know that all the artists for our next season are booked and the programs agreed. I know that many of you make your travel plans around our concert dates, so I am taking this early opportunity of telling you about the roster of exciting musicians who will be performing for you from October, 2019 thru March, 2020. I have been told many times that last season was "our best ever'' and the opera the best sung, and I want to make every season that way. Once again we have added an extra two weeks to the season so that it will continue until the end of March, thanks to funding from the Benefit event last month. The coming season has a fantastic array of musicians and music to suit all tastes, including two operas. You will hear a vast array of music not heard recently in San Miguel as we usually do not repeat a work within a two year timescale. As we also book most of the artists that far in advance, this is the reason why last season's new favourite artists won't return until 2021! The season will follow the pattern of recent years, with the opening concert on Sunday October 6, 2019, featuring the incredibly talented violinist Susie Park, associate Concertmaster of the Minnesota Orchestra, making her San Miguel debut ("prodigiously talented” The Washington Post). On Sunday, November 10, we will stage the second METROPOLITAN OPERA WINNERS CONCERT featuring the winners of the auditions that we will hold that week, and those receiving Encouragement Awards and Pro Musica's choice of Singer of the Future. This is a unique opportunity to hear the cream of Mexican voices before they go to the Regional Finals in New Orleans where earlier this year our 2018 winners won 4 of the 7 prizes. December 6 & 8 brings our first two concert weekend when Australian pianist Alexander Boyd will give two solo recitals ("truly breathtaking virtuosity" The Sydney Morning Herald). I can personally vouch for Alex's outstanding talent having heard him play last year in London where he wowed the audience. 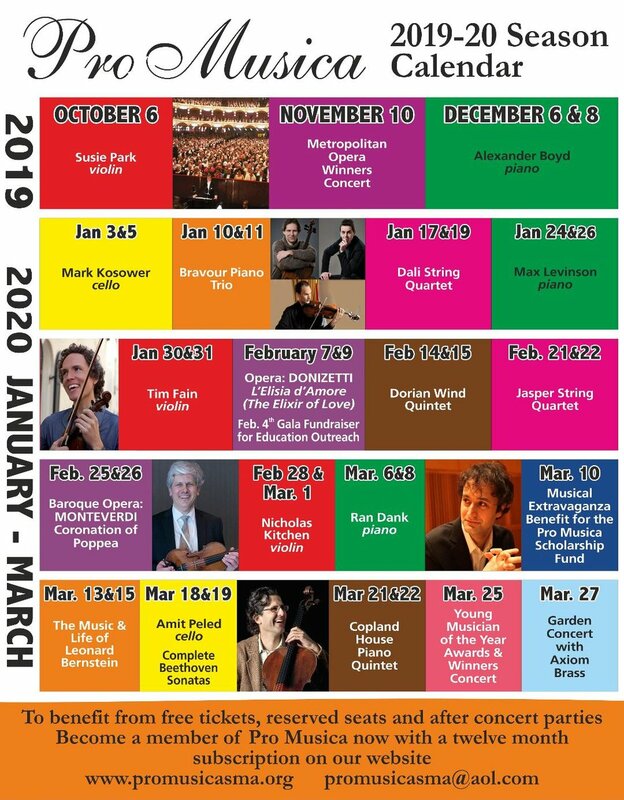 After the holiday break the New Year kicks off on January 3 & 5, 2020 with fabulous cellist Mark Kosower ("a virtuoso of staggering prowess” Cleveland Plain Dealer). Mark is principal cellist of the Cleveland Orchestra, and an internationally renowned soloist and will be making his San Miguel debut. From then on we have two concerts every weekend until the end of March. Next up, January 10 & 11 (Fri/Sat), features a return visit by one of our audience favourites, the Canadian Bravour Piano Trio (“flawless technique” The Toronto Star). January 17 & 19 features the first ever visit to San Miguel of the US based but all Latin American Dali String Quartet. (the "beautifully prepared program ... blazed." The Philadelphia Inquirer). January 24 & 26 sees another debut, pianist Max Levinson (“a brilliant American pianist .. touching the listener deeply" Los Angeles Times). Max is Professor of Piano at the Boston Conservatory of Music and an established international soloist. January 30 & 31 (Thur/Fri) brings the much heralded and welcome return after four years of violinist extraordinaire TIM FAIN. After appearing in San Miguel for ten consecutive seasons Tim is back with a fantastic repertoire of eclectic music. You may have heard his music for the Oscar winning film "Moonlight" since he was here. February 7 & 9 is OPERA WEEKEND featuring our first opera by master tunesmith Gaetano Donizetti, his famous L'Elisir D'Amore (the Elixir of Love). This will be preceded by our annual GALA FUNDRAISER on Tuesday, February 4th with the stars of the opera and the Pro Musica Youth Orchestra. More details will follow about the opera and the Gala in a separate news letter. On February 14 & 15 (Fri/Sat) there will be the first appearance here of the renowned Dorian Wind Quintet ("One of chamber music’s most sparkling and eloquent ensembles” TIME Magazine). Formed in 1961, they are loved by critics and audiences alike for their uniquely polished and passionate performances. February 21 & 22 (Sat/Sun) features Philadelphia's wonderful Jasper String Quartet including Grammy Award winning violinist Karen Kim ("The [Jaspers] have polished their art to near perfection.” Palm Beach Daily News). February 25 & 26 (Tues/Wed) brings our first full scale Baroque opera, a co-production with Opera Guanajuato, Monterverdi's "The Coronation of Poppea." One of the earliest operas and the definitive Baroque work of its genre. Following the success of last year's opera, we will have a Baroque Orchestra of 15 musicians. 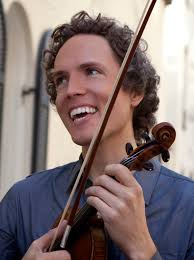 On February 28 & March 1 we welcome the return of one of the most sought after violinists, Nicholas Kitchen ("his performance swept all before it" The Boston Globe") for two violin/piano recitals. Renowned as the leader of the world famous Borromeo String Quartet, Nicholas is much loved by San Miguel audiences. March 6 & 8 is another highlight of the season with the return of pianist RAN DANK. All who have heard Ran play for us over the last few years will surely agree that he is one of the world's finest young pianists. The Chicago Classical Review said it all describing his Chicago debut as a "spectacular .. powerhouse performance .. dazzling in its pyrotechnics .. bravura .. extroverted brilliance". On March 10 (Tues) we present our third MUSICAL EXTRAVAGANZA to raise funds for the Pro Musica Scholarship Program we launched last year to celebrate our 21st birthday. The event will be similar in format to last season with a talented group of our much loved artists and special guests performing a full concert in a private home, preceded by a champagne reception in the garden, and food and drink in the house afterwards. On March 13 & 15 we present a unique show '"AN EVENING WITH LEONARD BERNSTEIN" (“The audience filled the room with lusty laughs and applause.” The New York Times) to celebrate the centenary of the Maestro's birth, tracing his life in song and music. After its huge success in New York we premier it in Mexico featuring soprano Amy Burton, pianist Michael Boriskin, audio visuals of Bernstein and friends, and narrated by Leonard's daughter, Jamie. On March 18 & 19 (Wed/Thur) another highlight of the season will be the celebration of another anniversary, the 250th birthday of Beethoven, when star cellist AMIT PELED returns playing on Pablo Casals' instrument with a cycle of the complete BEETHOVEN CELLO SONATAS, accompanied by David Korrevaar. March 21 & 22 (Sat/Sun) has the hugely popular Copland House musicians returning, this time as a first ever in San Miguel Piano Quintet. Those of you who know them will surely agree with the New York Times' description of them as "thrilling, vibrant and captivating". On March 25 (Wed) we present the inaugural PRO MUSICA YOUNG MUSICIAN OF THE YEAR AWARDS AND WINNERS CONCERT. This will be the final of our Mexico-wide auditions to choose the five most talented young instrumentalists in the country between the ages of 16 and 25. Our Scholarship Fund will award them prizes to further their development and careers totalling over half a million pesos. The season ends on Friday, March 27 with our famous GARDEN CONCERT in a magical private garden in Guadiana, including a long interval when unlimited prosecco and thousands of canapés will be served. This season we present one of America's most well known and respected brass quintets, Axiom Brass ("a stellar performance" San Francisco Classical Voice.) All seating will be covered to protect against sun and rain. Staging music of this quality becomes more expensive each year and our ever-expanding presence in the wider community also needs more and better resources. This includes the Pro Musica Youth Orchestra, our Children's Orchestra, and now the addition of the Young Musician of the Year competition. All this is only possible because of the generosity of our wonderful Patron Members. To help us maintain and exceed our objectives, I invite you to become a Patron Member from as little as $2,000 pesos a year and enjoy an unbeatable package of benefits, including free concert tickets, priority booking, invitations to post-concert events to meet the artists and reserved seats. This is a good time to join as your membership will run for a full twelve months and by joining now you will receive pre-season booking invitations. Full details of benefits are available on our website under the Membership tab, http://www.promusicasma.org/membership-1 . We also need more hosts for our ever popular post-concert cocktails and suppers. This is a wonderful way to get to know the musicians in your own home and I would be delighted to hear from you if you think you might be able to host. There is an easy to read calendar below of all the season's concerts.